First off, I want to give some love to Jon Sullivan, the mastermind behind the moody, fantastical covers I always feature on the reviews of this series. So, a tip of the hat to you, good sir. On the cover for Mark Hodder’s fifth installment of this alternative history series we see a huge metal man, and a small plaque that reads “Isambard Kingdom Brunel.” Like so many of Hodder’s characters, Brunel was a real and important figure in the actual Victorian era, but with a definite Steampunk twist. Due to an accident, Brunel had to build himself a body out of metal, and gave himself some upgrades in the process. But, the image is not showing him in Burton’s present, rather in a far off future where his body resides in the British Museum. 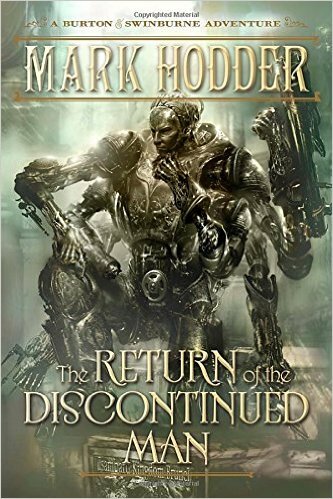 That’s right folks, Hodder wasn’t content just reconfiguring the past, he carries our heroes into the future. They make their trip through time in order to get to the bottom of a series of strange appearances in their own time. Spring Heeled Jack, or at least, a bizarre facsimile, keeps showing up in the places that Burton frequents, demented and demanding information from the king’s agent, but he has no insight to offer. That is, until he vicarious trip down memory lane with Edward Oxford, the original Spring Heeled Jack from Book 1 (and encountered by Burton 1, but this book is about Burton 2, keep in mind). The chrononauts must travel to the future in order to confront Oxford and attempt to stop him from traveling back in time in the first place. But, the effects of time travel are extremely disoriented, as demonstrated by the insanity of Oxford himself, so they take their trip in stages. This means plenty of stops along the way to sightsee in their future, one that is nothing like the vision that Burton experienced, but one that has become a twisted version of the worst aspects of the Victorian era mixed with technology that is centuries beyond what we have in our own time. I thought this whole premise was intriguing, and Hodder continues to be a delightful story-teller. He continues his journey into the depths of the Burton character, and how he is both alike and different from Burton 1, who of course is not the same person as the historical figure from our own reality. In this book you get to have not only steam-driven vehicles, clockwork men, and time traveling dirigibles, but there are also microchips, nano-sized torture robots, cloning, and genetic manipulation. For fans of alternate history and speculative fiction alike, this is a must-read. Read about The Strange Affair of Spring Heeled Jack, The Curious Case of the Clockwork Man, The Expedition to the Mountains of the Moon, and The Secret of Abdu el Yezdi.